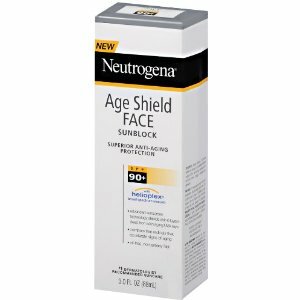 Neutrogena Age Shield sunblock has a very high SPF 90+, this protects at least 6 layers of ski from sun damage which courses premature aging. This lotion is devised to be absorbed quickly to protect the skin from UVA and UVB rays and it is oil free for a non greasy feel. As I have said in previous posts, most people like the sun kissed look but it does come at a price to your skin. Sun damage dries the skin and can cause premature aging, so always wear sun screen to protect your skin. I have summarized the information below from the opinions of people using the lotion. I was unable to find the ingredients list for this product. It seems Neutrogena has made a very popular sunscreen, I can't find a bad word said about it. Fanatics don't just like how it protects their skin from sun damage with its high factor SPF90+ but they also think it works fabulously as a makeup base too! You can get two 3oz bottles for $19.79, which I think is a real bargain considering the fact that you could save loads on not having to buy a makeup primer.